Study authors, who hail from Purdue University, interviewed officials with the Michigan Department of Environmental Quality, the Michigan National Guard, and the Genesee County Metropolitan Planning, among others, to figure out how much waste the water crisis generated and how the city and state responded. Turns out that public-private partnerships and good public communication were integral to cleaning up this plastic waste. The city plugged into companies it had already contracted before the crisis to boost its waste collection services. And it launched an updated water bottle recycling program not long after its emergency declaration. 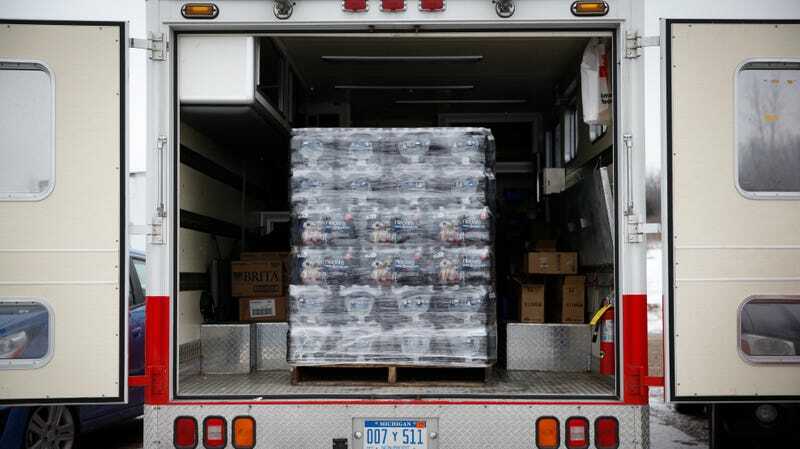 This increased the number of curbside pickups and trash bins throughout Flint where people could leave their used water bottles and filter cartridges. At points of distribution where families picked up their free water bottles, they also could drop off any used ones. Republic Services, a private company that handles the city’s recycling, picked up much of the waste. It also donated boxes to churches and commercial buildings where residents could drop their plastic and trash for Republic to pick up. What was key was informing residents that all these options were available—and the authors found that the city and state did a damn good job of that. This information was all over the city: on billboards, on the radio, and on TV. After the emergency declaration, recycling participation increased by more than 10 percent to 27 percent. About 65 percent of the residents were using the curbside pickup. While this is all great, the authors do note that avoiding this trash altogether would’ve been better—and that’s a lesson for other cities. Convincing residents to treat their water at home with filters is preferred. Setting up water tankers or temporary water treatment facilities in the community could help avoid all this trash, too. The Environmental Protection Agency and Federal Emergency Management Agency offer advice for short-term water outages, per the study, but there’s guidance on any crisis that lasts more than 21 days. The authors urge federal agencies to take a closer look at this issue so that cities and states don’t have to figure it out all on their own. Lucky for Flint, its trash situation turned out all right. The city is, however, still dealing with its lead crisis. The water’s not necessarily still toxic, but residents don’t trust it anymore. Mayor Karen Weaver announced earlier this week that the city’s ahead of schedule in replacing all its lead pipes, which should quell some fears. Other larger cities battling their own lead crises—like Newark, New Jersey—may do well to take a close look at this study. Plastic water bottles sure aren’t lead, but mismanagement could cause them to accumulate in landfills or, worse, our oceans where they break down and enter the food chain.